This new mural in Ballyduff commemorates the sacrifice of the Ulster Volunteers and Young Citizen Volunteers who fought in WWI and in particular their action in 1916; 2016 is the centenary of the Battle Of The Somme. 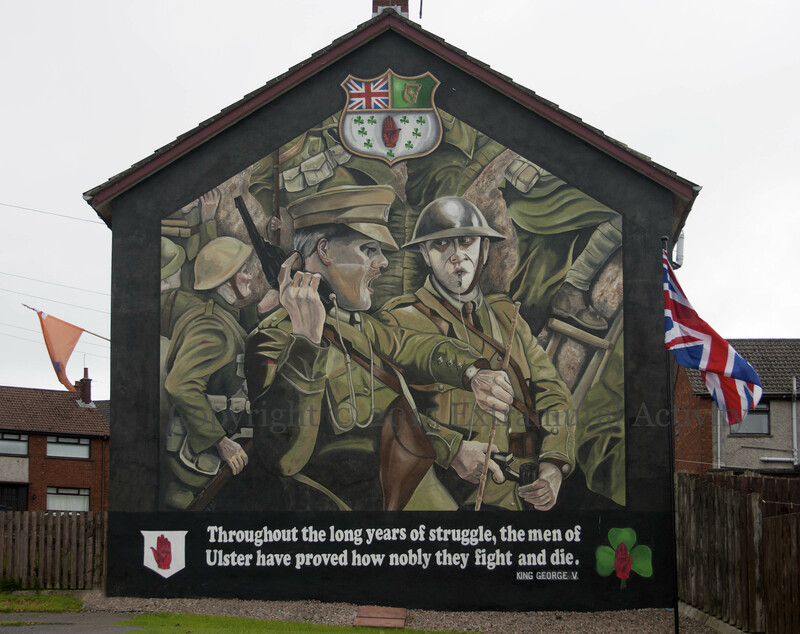 The flag of (modern) UVF 1st East Antrim battalion flies on either side of the mural. Five images of a new, multi-wall, mural in Ballyduff. The main panel shows WWI soldiers bowed over graves in Flanders surrounded by poppies. This is accompanied by the red-hand emblem of the Ulster Volunteers and the shamrock of the YCV. On a side wall (see the fourth image) is a verse from American professor Moina Michael’s poem We Shall Keep The Faith: “We cherish too the poppy red that grows in fields where valour led; it seems to signal to the skies the blood of heroes never dies”. It was Michael who began to raise funds for servicemen by selling (silk) poppies, also adopted by the British Legion in 1921 (WP). The years of operation of the UVF in this new Ballyduff mural are given as 1966-1994. The main loyalist paramilitaries began what was to be a lasting ceasefire on 13th of October, 1994. The ceasefire was announced by Gusty Spence, who was the organisation’s original leader in 1966. Replaces a UDA board, featured previously. 16 towns and town-lands of south-east County Antrim are named in this recent UFF mural: Rathcoole, Rathfern, Monkstown, Shore Road, Whitewell, Glengormley, Greenisland, Carrickfergus, Whitehead, Ballycarry, Ballyclare, Larne, Newtownards, Antrim, Antrim, Ballymena, Braidside. This mural was painted in late summer, 2015, on a wall that had been blank since at least 2008. 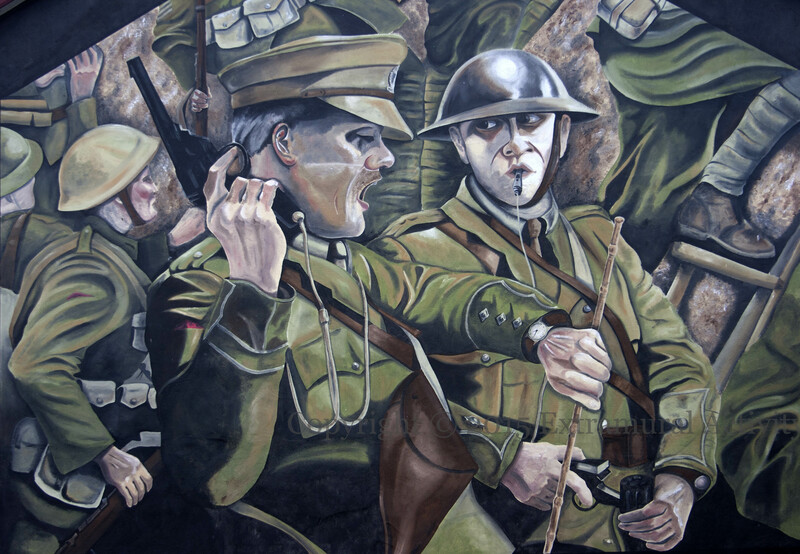 In 2006, it bore a UDA mural, for which see M03060 (by Peter Moloney). Good walls for murals can be hard to come by. Here are three ‘reservations’, two from Newtownabbey and one from Bangor, claiming walls for the UVF, UDA, and RHC, respectively. 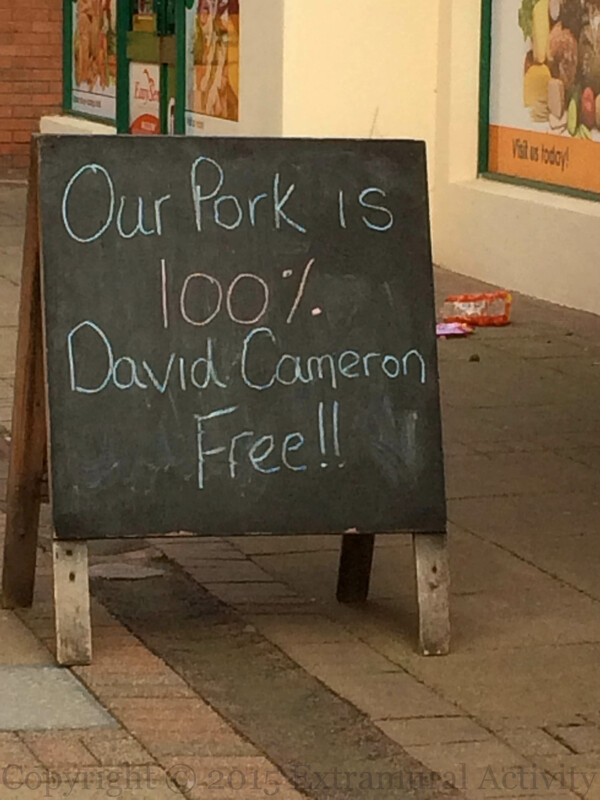 “Our pork is 100% David Cameron free”. This chalk-board outside a butchers in Glengormley makes reference to the allegation that David Cameron came into intimate contact with a dead pig while at Oxford. Although the allegation hasn’t been substantiated, the affair has taken on a life of its own and is known as “piggate“. Soldiers from the 36th (Ulster) division in the trenches of WWI prepare to go ‘over the top’. One waits for the precise moment according to his watch, ready to fire a shot, while the other prepares to blow a whistle and launch a flare. “Throughout the long years of struggle, the men of Ulster have proved how nobly they fight and die.” King George V on November 16, 1918. The quote also appears on the Ulster Tower in Clandeboye.